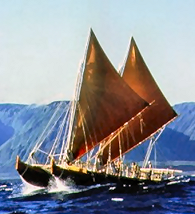 Transoceanic Polynesian voyagers navigated across the Pacific and arrived in Hawai‘i hundreds of years before Europeans dared venture across the Atlantic. They found a remarkably rich archipelago that in turn created a unique and rich indigenous Hawaiian culture. A modern resurgence of Hawaiian cultural practice and values includes a growing appreciation of the native species and ecosystems that made it all possible. In 2010, the Hawaiʻi Conservation Alliance of 25 of the leading agencies and organizations in conservation, ratified a position paper affirming the value of Hawaiian Culture in Conservation. Such an approach would be grounded in ancient Hawaiian traditions, but relevant to our times, responsible to Hawaiian culture as well as scientific rigor in order to protect Hawaii’s native culture and natural heritage through active stewardship, research, and education. What are the elements of Hawaiian culture that would make such a melding desirable? This saying speaks with pride about the famous mountain of O‘ahu, its highest peak, Ka‘ala (above), regarded as sacred and pristine. It is not surprising that Ka‘ala still confers that sense of deep awe when visited today, and it is clear that we can share and appreciate ancient values even in modern times. One aspect of a traditional Hawaiian approach to conservation is the central role of humans in the natural world. Instead of primarily viewing people as the problem, it acknowledges that people are part of the living universe, with clear responsibilities to nurture the land in a reciprocal and sustainable manner. It boils down to establishing a relationship between people and their lands. For native Hawaiians, these islands are the “one hānau” the “birth sands” and so it is a responsibility to know your lands and care for them. For most conservation biologists who work here, a similar relationship grows out of long-term, intimate knowledge of the species and systems in which they work. 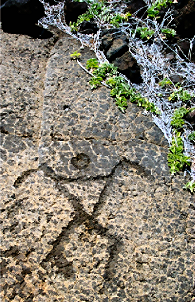 Hawaiian material culture relied upon native species and ecosystems. 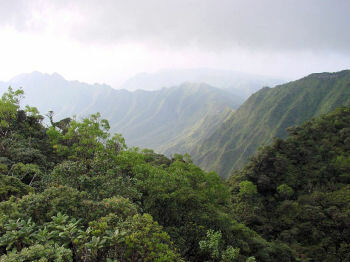 Thus, the unique biodiversity of the Hawaiian ecoregion valued greatly by evolutionary biologists worldwide also generated an equally rich cultural system in the isolated, pre-western indigenous Hawaiian society that developed within it. Native species carry great cultural significance and value that can and should be wielded as a powerful basis and justification for conservation. 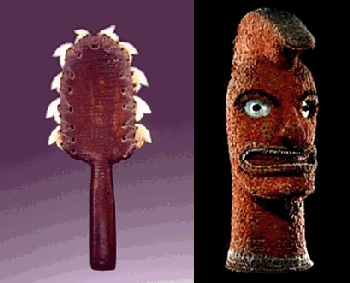 Lei o manō (sharktooth weapon) and ki‘i hulu (feather god image) are material examples of biocultural resources. 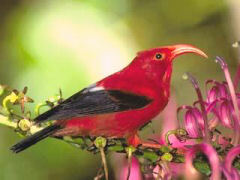 The ‘i‘iwi is a sacred bird, associated with the ali‘i (high chiefs). In modern Hawai‘i it is increasingly difficult to connect meaningfully with the natural world. Hawaiian tradition tells of snails singing and whistling in the upland forests. This indicates that the needs of the land coming first; and once these are satisfied, the land can properly support the people living upon it. Pueo (Hawaiian owl) is an ‘aumakua to many Hawaiian families. The red blossom of the lehua is the kinolau of the volcano goddess Pele. If apathy is the enemy of positive action, then generating a caring relationship is the key to maintaining positive stewardship. Hawaiian cultural elements pertinent to this include the ‘aumakua (ancestral god) relationship, holding that deified ancestors can take the form of native plants and animals, and the related kinolau concept, wherein living plants and animals may be physical manifestations of deities, and thus held sacred. The foundations for this relationship can be seen in the Kumulipo, the Hawaiian chant of creation, thousands of lines long, in which people appear long after other living things, which themselves precede even the gods. 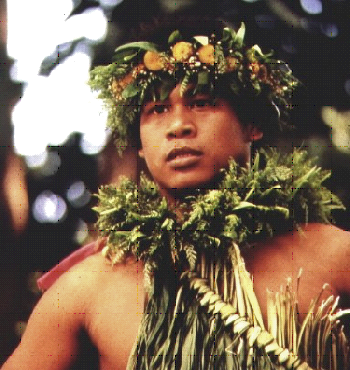 Hawaiian tradition holds we are the direct kin with the living elements of native ecosystems. Humans are the youngest siblings in the genealogy of creation, and the youngest are charged with care of the family elders. The natural world extends its kinship influence all the way up to the moral and spiritual basis for behavior; what is allowed (noa) and what is restricted (kapu). Recent flowering of both biocultural approaches to conservation and community based co-management of natural resources in Hawaiʻi means that the cultural underpinnings described here are being expressed more and more as a viable tool for conservation. 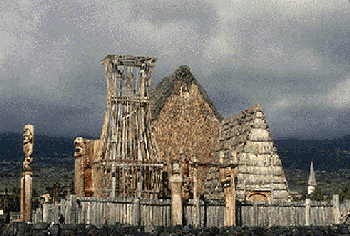 Human use of natural resources in ancient Hawai‘i were based upon religious restrictions (kapu) that maintained proper balance (lōkahi) at multiple levels, between people and resources. Abuse of resources under kapu was punished harshly, typically by death of the violator, lest doom come to all. When balance was achieved, kapu could be lifted (noa) and resources used with care. Integration of the natural world with spirituality brings stewardship into the realm of moral obligation. Reinsertion of humans into the native landscape is something that extends beyond the typical bounds of western science. Relationships that involve the spiritual side of human existence tend to be avoided by western science, but are sought and embraced by Hawaiian culture. 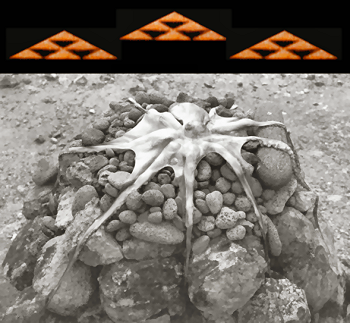 Integration of cultural and natural resources on Kaho‘olawe island provides a model for conservation approaches supported by traditional spiritual practice. 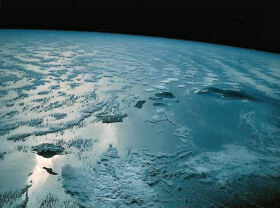 Ultimately, Hawaiian knowledge was empirical, based on repeated observations of patterns in the universe. 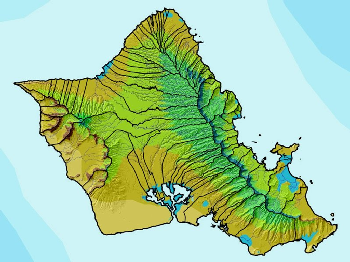 Such patterns extended to entire islands, seen in the traditional land management system, wherein an island was divided into natural watersheds (ahupua‘a) extending from mountaintop to deep sea, ensuring access to the full range of natural resources for people living within an ahupua‘a. Ahupua‘a boundaries of the Island of O‘ahu (black) show remarkable optimization of access to ecological system resources. 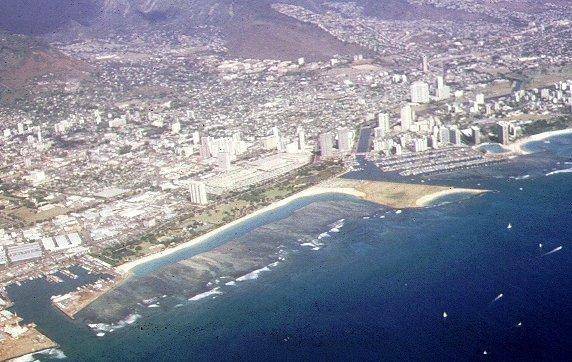 Hawaiian science was intensely practical, since lives of thousands of people on a limited landbase was dependent on its application. Agricultural engineering of the wet lowlands supported a population of a similar order of magnitude as today (about 1 million) -- now precariously dependent on global importation of food and other resources. Hawaiian science was empirical, experimental, repeatable, promulgated via stories and chants, tested, adaptive, and thus of great value to modern conservation.